I'm trying to play this as part of an arpeggiated version of Hallelujah. For arpeggiating C, Am and F cord I find it easy to know which strings to pick and it sounds right. But when doing the same for G it sounds off. For example on C cord I pick the (6th is low E) 5th, 4th, 3rd (open) and 2nd string and it sounds fine. But for G I pick the 6th, 5th, 4th (open) and 1st string (as those are the ones fretted plus one open string to keep the meter) but it doesn't sound right. Am I doing it wrong? I have standard tuning by the way. I think my issue is the 3 open string gap between the fretted 5th and 1st string on G chord and not knowing which to pick if any. The open strings are all part of the chord so there's no reason for you to primarily target the fretted notes. The notes in the G chord are G, B, and D - so the open G, B, and D strings fit in very naturally. In fact I often avoid playing the 5th string in the G chord because, while it is part of the chord, it can sound a little "muddy". I also notice that you're playing strictly from the bottom E string and up - you can also go in the other direction if you want, or even switch directions. You can try similar patterns on the other chords as well, but there are really no limitations - try to experiment and see what kinds of patterns you can find. Any string that's open or fretted for a particular chord is good to use for that chord. When arpeggiating on guitar, the go-to is root on the 6th or 5th string, and some other notes contained within the chord. With a C chord, there are three options for a low note - bottom string open (the 3rd of the chord), bottom string 3rd fret (the 5th of the chord) and fifth string 3rd fret (the root). Generally, that root sounds most stable, but any of the three will work. What else you pick will be down to what you think sounds good, and there are many optional combinations. With a G chord, root is bottom string 3rd fret, third is fifth string 2nd fret, and fifth is D string open. Again, all will work, and there's also another voicing choice of B string open or B string 3rd fret. You, as the player, can choose which combination gets used, so get the ears working, and try all the options. There is no absolute right way, unless you want to copy the original, but that actually may still not be the best - it's subjective. I normally play Hallelujah in Bb rather than C, using a rather unusual tuning that happens to go down to D, but the voicings I use could also work in C major, Standard tuning if fingered as shown. 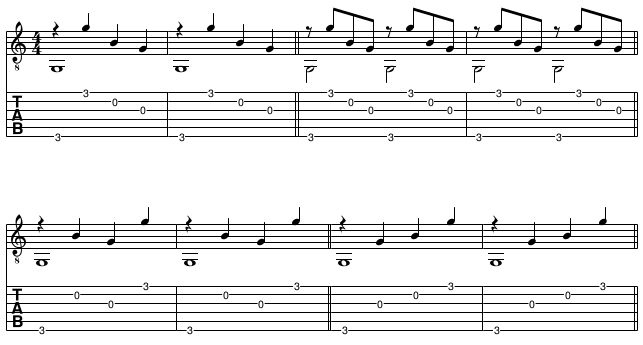 Play the lowest three sounding strings in each group individually for the for the first three eighth-note beats, and then the last two together for the next quarter or dotted quarter. Ideally, repeat the first note of each group on the upbeat just before moving on to the next chord, but if you can't, just get ready for the next chord. The Hal Leonard sheet music puts a dominant 7th on the second syllable of "composing", which I like better than the minor chord used in many other arrangements. IMHO, the "secret chord" is a dominant seventh with parallel thirds resolving up to parallel roots on the next chord, and with the downward-resolving seventh between them. One could use an E7 voiced as 0-x-2-1-[0-0] or Em7 voiced as 0-x-2-0-[0-0] but if you can play the E7 with the double tritone the effect is very powerful. Not the answer you're looking for? Browse other questions tagged guitar chords arpeggios or ask your own question. Why make minor 7th chords with 2nd and 3rd fingers?